Low sheen is definitely the most popular. In fact 90+ percent of customers either directly ask for it, or sway towards it after hearing the benefits over full gloss finish. On top of it’s sleek modern look, it’s also a low floor care and maintenance option. Polished Timber Flooring in Low Sheen – What Are The Benefits? It has a contemporary feel and look about it that compliments new renovation work and is the choice of most builders when constructing new homes. 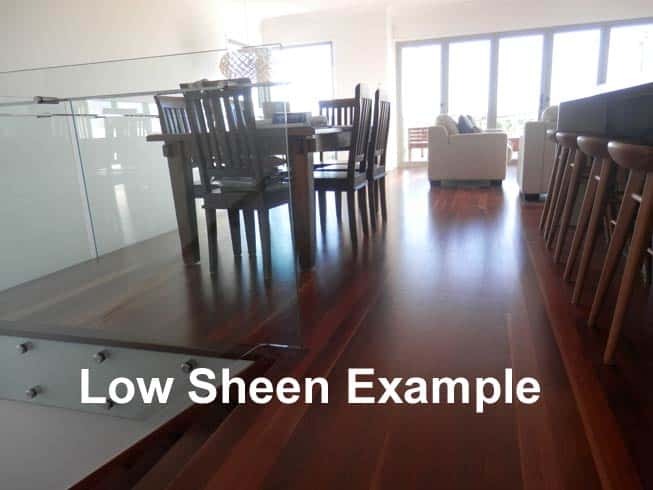 Low sheen finish hides minor dust, or more to the point, it does not stand out as much as it does on high gloss polished timber flooring. If damage occurs on a full gloss floor, then light reflection will accentuate it at the edges. In contrast, the lower sheen finishes reflect less light so it’s visually much more forgiving. Low sheen finishes are low maintenance and a great choice for families with a busy lifestyle. They have a modern appearance and hiding minor dust are the main attractions for this choice on polished timber flooring. It’s also a great option if you are a landlord of rental properties with polished timber floors. There will always be the hard-core lovers of full gloss out there, that’s for sure. About ten to fifteen years ago it was the most popular choice of builders and home owners alike. 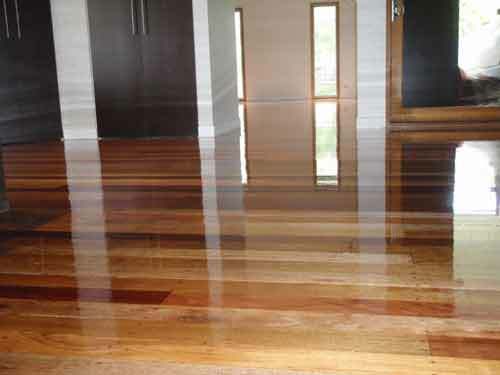 Most clients with polished timber flooring in classic Queensland style homes choose high gloss finish. This is with good reason as it looks amazing on Hoop Pine floors! The light golden colour and variations within the Hoop Pine grain look great. Also, full gloss seems to fit in with the character of the colonial style. It can be compared with sitting in a black shiny car when you’re at eye level and looking across the high gloss bonnet, you see every speck of dust! It’s a catch 22. Even though the low sheen finish is a more contemporary and modern look, the potential buyer of your home has tunnel vision. They only see the wow factor of a shiny floor when viewing your home. Also, they have no concerns over the low maintenance qualities the low sheen provides. Once settled in after a purchase, they soon learn it’s not all that fun cleaning them every day. Do not get put off though, all gloss level options for timber floors and polished timber staircases have their benefits and all look great. It all boils down to personal preference, and your particular circumstances. If you have an inside dog, then low sheen would be a more suitable choice. This is because dog claw damage to polished timber floors can ruin them, and in a short period of time. Once again, the damage would be accentuated with a full gloss finish. Down lights can cause a spider web type of an effect on your floors at night. This is caused from ‘directional light’ hitting the surface and spreading out on your floor. As this happens, it highlights the rotary sanding swirl marks. These rotary lines are not normally visible in natural or normal lighting conditions. It is called ‘light refraction’ through the coating. It is more prevalent with full gloss floors. This condition is made worse if you have a dark floor. Worst case scenario for down lights – Dark floor and full gloss finish. If you have any questions please feel free to call the Brisbane sanding and polished timber floors specialists right now on 0419684404.